“I am in spirit. I see and act like the Creator does.” This is the opening for any exercise of the New Knowledge for the New Age (NKNA) and immediately I drop into this expansive field of energy, fully stepping into my authentic power. There are many exercises for NKNA, each focusing on allowing our physical bodies to return to the state that is in alignment with the perfection of the Creator. Last week I was sick with a stomach virus and running a fever. I tried to reduce the fever with aspirin, Advil and a hot bath. It finally occurred to me to use a NKNA exercise and within minutes the fever broke and I felt tons better! It was a very dramatic response. If you enjoy cutting edge consciousness experiences, then I encourage you to join this amazing community of like-minded people, all joyously playing in the expansive field of infinite possibility. I’m happy to answer any questions you might have about the value I’ve received from being a part of this community. 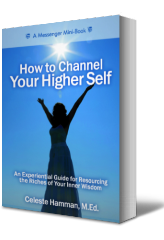 Feel free to send me an email at celeste@ChannelYourHigherSelf.com. Also, watch this space for opportunities in January to play with using your energy bodies as portals for receiving guidance as you plan for 2011. 2. Sit quietly using a centering breath to bring your focus inwards. When your mind and body have stilled, allow the words, “I am in Spirit. I see and act as the Creator does.” to be present in your awareness. Hold your focus on these words, gently bringing your mind back to them when you become aware that you are thinking about something else. (This is normal to have your focus drift, but it becomes easier to retain focus the more you practice.) As you sit with this phrase over time, notice what feels different for you. Can you sense a field of expansiveness? Do you feel calm and peaceful? What other physical or emotional sensations occur for you? All of these feelings can become “portals” for you to access your Higher Self, receive communication and initiate healing.